The smallest of the breeds in the canine world this is the ultimate, toy lapdog. 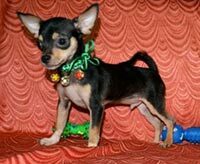 There are two varieties, the smooth coated (short-haired) and long coated, the Chihuahua offers humor comfort and companionship. It is small and fragile but alert and bold. it is named after the Mexican state from which it was first exported to the US. Care should be taken as the thin bones in the front legs may break with injuries. 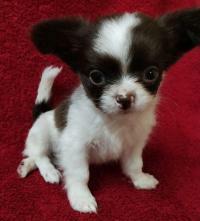 The Chihuahua weighs between 1-3 kgs and is 15-23 cms tall. 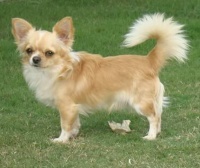 Satya's Home Housing Very Beautiful, Long Coat & Smooth Coat, KCI Registered Chihuahuas. Dogs are raised as part of the family. Puppies occasionally available for sale. For more details contact: Satya, Ph: +91-7299004969; Chennai. Cream Passion Chihuahuas: Our dogs live with us pets and are raised as part of our family. Our dogs have proper Apple Head, Big Eyes, Small Nose, Short Snout and most importantly they have very friendly and loving temperament. Our dogs are registered with KCI, De-wormed, Vaccinated, Microchipped and Socialised with kids before sending to new home. Click Here to See Litter Box, Photographs of Sire, Dam, Puppies and More Details. 4 Cream Puppies Available in the Current Litter. 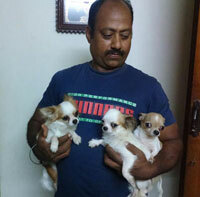 Shruthi Offers Long Coat Chihuahua Puppies. Affectionate, Loving Breed. Puppies raised with Lots of Love and Care. Healthy and Playful. Puppies have had two rounds of Vaccination and have been de-wormed regularly. 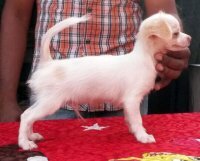 KCI (Kennel Club of India) Registration has been applied for and Certificates should be available soon. Puppies can be sent to most metros after mutual discussion. Click Here to See Litter Box, Photographs of Puppies and Parents.